CS-Cart is a popular eCommerce solution that includes features for marketing, design, and more so that you can build a shop for your website quickly and easily. The program offers accessibility anywhere you have an internet connection and comes in multiple editions aimed at different sizes of business. This is a pretty solid platform, and is well worth a look, though there are a number of drawbacks. The platform may or may not suit you depending on what you need in an eCommerce solution. A limited free version is available to try their software. Their dashboard backend is very user intuitive. With no review module and no upselling options, there is a potential for lost conversions. Technical support is only free for 30 days. One of the few drawbacks we noticed was that the website for CS-Cart itself is kind of hard to navigate. There doesn’t seem to be an About Us page, though the company does seem to have plenty of experience. There also is no simple list of features for the eCommerce software, though there are numerous screenshots that can give you a feel for the user interface and the features available. On the Features Tour page you’ll find a lot of features listed, but it does not seem to be an exhaustive list. There seem to be design features, for example, but the design features are not listed here; they are simply alluded to in the screenshots. There is no website builder associated with this service, so you won’t want to use it if you are looking for an all-in-one solution to build a site from the ground up. If you already have a nice store and just need the administrative capabilities of the shopping cart software, however, it could suit you just fine. In terms of administration, bulk uploading and advanced inventory management are available. You can sell downloadable or physical goods and there are numerous payment methods you can accept at checkout. Analytic reports on traffic and sales help you to track the effectiveness of marketing campaigns and make decisions about the products you’re going to be selling. There is no delivery network, and staff controls are optional. There is no SSL security since hosting is not offered with this service (and therefore no uptime guarantee simply because it is non-applicable). Fraud prevention is another optional security service. Where marketing is concerned, you can make product coupons but there is no daily offers option. The service is search engine friendly, and includes a newsletter system and social networking features you can use to keep in touch with your clients and promote special offers. Direct social offers are not available, nor are customer reviews. Live chat is included with the software, as is a loyalty program, and retention tools for emailing your customers are optional. Up-selling and cross-selling aren’t available, but there is an affiliate system, gift cards, and gift wrapping. 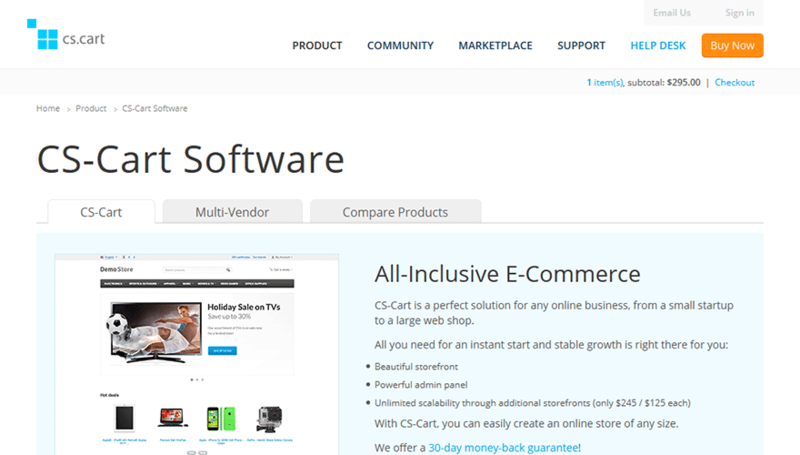 There are four pricing tiers for this software, and at its most basic level, CS-Cart is free. The Community edition of the software can be downloaded and installed without paying nothing at all, and you may use it for a single storefront indefinitely. Many features are included such as a ready storefront, website content management, unlimited products and categories, downloadable content, inventory management, and one-page checkout. The catch is that with the free edition you do not receive marketing tools, affiliates, loyalty systems, multiple languages and currencies, and several other features which may come in handy. The free edition is not only a great way to try out the software, though, it’s also a great way to try out building an online store for the first time, and you don’t have to pay for anything except your hosting. The three paid tiers offer everything that’s in the Community package plus additional marketing features. The Professional edition goes for a one-time payment of $345, the Multi-Vendor costs $985 (and may be used for multiple storefronts), and the Ultimate edition costs $650. Once you’ve paid your setup fee, you don’t need to worry about monthly installments unless you want to pay extra for features like technical support. This means that you may save money going with a product like CS-Cart in the long run, though we have reviewed other platforms which use this kind of pricing scheme and cost a bit less and offer a bit more. Support is another area where CS-Cart loses some points. Customer service is available via phone or email, but not live chat, and we’re not sure it’s in-house. Nor is the service available 24/7, and nor did we find a user manual or FAQ. There is a knowledge base but no video tutorials, and there is a forum and a company blog. There’s a catch for technical support, however; you have to pay extra to receive assistance. What CS-Cart does offer in terms of administrative features is good, though there are areas such as marketing where their features are lacking. Their pricing scheme at first seems a great deal, except when you consider you have to pay extra for technical support. For a beginner just trying to get started, however, the free package may offer a good way to get a feel for operating an online store. TopFiveAdvisor gives CS-Cart a 7/10.